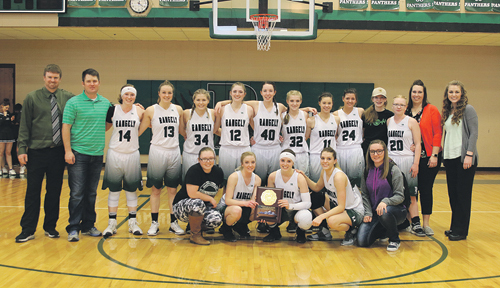 RANGELY | The lady Panthers basketball team pulled off a couple big wins last weekend as they hosted the regional tournament. The Lady Panthers were matched up with Norwood to start and the Panthers came out swinging. In the first half, the Panthers jumped to a big 30-12 lead over Norwood. The Panthers continued to roll through the second half, never letting Norwood score double digits in any given quarter. The lady Panthers got the players off the bench some time, playing the whole fourth quarter. The Panthers won 63-25, led by Katelyn Brown who had 24 points and Skylar Thacker who added 16. Saturday the Rangely girls met Daysprings Christian Academy for the regional championship and a state tournament spot. The game was fast from the jump, Daysprings got a little bit of a lead at the beginning, but the Panthers shot their way into the lead at the end of the first quarter. The rest of the half would also prove to be high scoring. The lady Panthers were scoring from the post almost at will, and the Panther squad took advantage of their inside game. Going into the locker room at halftime the Panthers held a six point lead. The second half of the game was dominated by the Rangely girls, holding Daysprings to seven points in the third quarter while scoring 17. The Panthers extended their lead through the fourth quarter until the girls off the bench were put in to finish out the game. The Panthers won 65-40, and clinched their first state tournament qualification since 2002. The Panthers were led by Katelyn Brown who had 19 points. She was followed by her younger sister Kassidee Brown who added 16 and Skylar Thacker also had a double digit game with 12. The lady Panthers go into the state tournament the No. 3 seed, and will match up with the No. 6 Wray Eagles on Thursday, March 8 at 4 p.m.